In the new book, “Sweet Freedom: Losing Weight and Keeping It Off With God's Help,” author Teresa Shields Parker shares how to get free from emotional, spiritual and physical bondages holding us captive from realizing our true destiny in Christ. Eating is necessary for survival, but eating everything and anything we want, anytime we want has become a national pastime. In the new book, “Sweet Freedom: Losing Weight and Keeping It Off With God's Help,” author Teresa Shields Parker shares how to get free from emotional, spiritual and physical bondages holding us captive from realizing our true destiny in Christ. 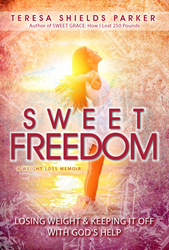 “Sweet Freedom” is a follow-up to her 2013 weight loss memoir, “Sweet Grace: How I Lost 250 Pounds,” which is the longstanding #1 Christian Weight Loss memoir on Amazon. Once weighing 430 pounds, Parker struggled with weight most of her life. Now, after losing more than 260 pounds, she has identified some secrets to freedom from food and, especially, sugar addiction. The things she discovered work for those in any addictive cycle. Parker asserts that freedom from control of certain foods, or any substance, is possible with God's help. The walls standing in the way of freedom will crumble, when we are willing to dig deep to unearth roots of buried pain, ridicule, fear, doubt, guilt, other negative and debilitating emotions and, even, spiritual misbeliefs. In “Sweet Freedom,” Parker shares how she used simple tools, such as tearing down barriers, finding the root source of problems, forgiving things and people in her past, renouncing lies, understanding God's truth and connecting to Him in a deeper way to break into her new healthy living lifestyle. Sugar addiction may be the most insidious addiction of all because many do not understand how certain foods can be addicting. The book explains how subtle situations can override a person’s rational thinking and create emotional strongholds making us think we have to have certain foods. “Sweet Freedom” is a rare glimpse at the gut-wrenching truth of how a super morbidly obese woman allowed God to work to release her from super morbid obesity. In addition to being an author, Parker is also a personal coach, speaker and blogger. For more information, visit her website at TeresaShieldsParker.com. “Sweet Freedom” is published by Write the Vision Publishing.